Taylor Swift has been working in the music world for years now and she is constantly trying to reinvent herself when it comes to her sound and her fashion choices. While Swift has had a number of styles that we love, this modern and revealing dress is not one of our favorites. Her blunt haircut and the asymmetrical lines and slits on the dress makes it seem like she just walked out of a time machine. A true icon and a risk-taker when it comes to fashion, while many of J-Lo’s outfits have had people divided into naysayers or supporters, the public almost unanimously agreed that this red dress the singer and actress wore to the 2015 Met gala was a hit. The sheer panel on the side of this dress shows of Jennifer’s curves without being too provocative. J-Lo looks drop dead gorgeous and she makes us forget that she is almost 50 years old. Laverne Cox is best known for acting in Orange is the New Black but the celebrity is making us think that leather should be the new cotton after wearing this one-shouldered show stopper to the Grammys red carpet. Cox definitely knows how to make a statement with a dress and although the dress it is pretty provocative with its leather and chains, it somehow manages to give off a classy vibe. Gwyneth Paltrow is a gorgeous woman who would look good in almost anything. However, after seeing this look come down the red carpet, we are not sure if she SHOULD be wearing any outfit. The actress and creator of Goop is showing a ton of side leg in this designer dress and we wonder how much she paid for wearing something with such little material. If Paltrow turned the wrong way in this dress it could spell a potential fashion disaster. How old is too old to wear a sheer, sequin jumpsuit? Some may say that 71 might be a cut off age. 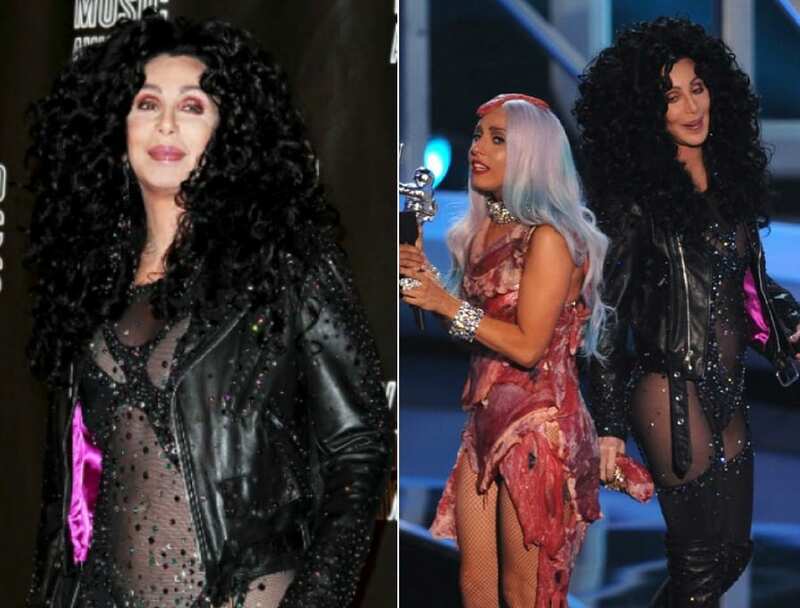 Cher has always been a fashion icon over her long career, however, it sort of uncomfortable to see an older person trying to dress like they are still in their twenties. Don’t get us wrong, Cher can do as she pleases but we think she may have gone a little far in this over the top jumpsuit that she paired with thigh high boots. So far we’ve seen a number of dresses similar to this one which Jaimie Alexander wore in 2013 to the Thor: The Dark World premiere. While some of these cutout dresses have been fashion-dos, this is (in our opinion) a fashion don’t. The lines on the dress are just too strange and they don’t do anything for Alexander’s figure. It would have been much nicer had it just been a plain black dress. J-Lo’s status as a fashion maven was solidified after she wore this flowing green Versace number to the Grammys back at the beginning of the decade. Like it or not, this dress is very revealing and it put J-Lo on the map as someone to look out for when it comes to fashion. And from the looks of her smile, she knew exactly what she was doing when she hit the red carpet with it. While the avant-garde singer Lady Gaga is known for her outrageous fashion choices, this is actually one of her tamer outfits. Although this is a more classy look for the popstar, she still managed to show her curves while strutting her stuff at the Grammys alongside the legendary Tony Bennett. The slits in Gaga’s dress almost met in the middle as the slit in the leg was so high and the neckline so low. However, this is a style that we rarely see from Gaga and we can’t get enough. Rita Ora got the sheer side panel look right! Although this trend has been tried over and over again, very few stars have gotten it right, however, Rita deserves an award for being the one that pulled it off. The British singer and actress appeared at the Vanity Fair Oscar party in this partially sheer dress with a long black train. While the dress is very revealing, the provocative parts are balanced out by the elegance of the train. If ever there was an opportunity to wear an over the top and revealing gown, the Met gala is the perfect place. Queen Bee was the talk of the red carpet in 2015, when she showed up in this glittery, sheer and figure hugging dress. Although this dress is extremely revealing, it is so unique that it was widely acclaimed amongst fashion enthusiasts and on best dressed lists throughout the media. It has become an iconic dress in Met gala history. It isn’t so hard for a supermodel to look good in a curve-hugging dress, and Heidi Klum is a testament to this. The stunning model looked like the picture of elegance and glamour in this gold Art Deco-inspired number. Although Klum was showing a lot of skin when she showed up to the 2013 Oscars in this, she still managed to look classy and like a golden Oscar statue. Heidi does not disappoint on the red carpet. While we have a lot of criticisms about this dress, we have to give January Jones credit for perfectly matching her lipstick color to it. The Mad Men star showed up to the 2011 Golden Globes in this dress that just has too much going on. On their own, a v-neck, cutouts, and fringe can look nice on a dress, however, when added all together in one look it just becomes a sort of Frankenstein monster of a dress. Over the years, Bella Thorne has grown from being a Disney Channel star into a young and risk taking woman. Her style has evolved quite a bit over the years and we are loving this sleek and edgy look and Thorne was wearing at the Critics Choice Awards. Although we can see a lot of Bella in this dress, there is enough material to make give her a classy look while atill making a big statement. We have to admit we love this sparkly dress that The Simple Life star wore to the Cannes Film Festival back in 2015. Paris pulled off this subtly revealing dress with style and confidence and it’s definitely one of the best outfits we have ever seen her in. THIS is how you do sheer, this is how you do sequin. With a beautiful body like hers, Ms. Hilton should be owning the red carpet more often. While Gisele is now mostly known for being Tom Brady’s wife, before she met and married the NFL player, Bundchen best known for being a world famous supermodel and one of the richest women in Hollywood. The model was turning head all over the place after stepping out in this rose colored gown at the Met gala back in 2008. The dress is revealing in all the right ways and judging by the look on her face, Gisele knows she looks good. You know those people who could wear a paper bag and somehow make it look good? Well Gigi Hadid is one of those people. There is a lot going on with this outfit including a thigh high slit in the skirt and a caged crop top. While it’s not to everyone’s taste, Gigi manages to pull the look off and stand out on the red carpet at the AMAs. While we’ve seen Gigi in much nicer outfits than this, we can’t ignore the fact that she is rocking this get up. Miley Cyrus was in her “We Can’t Stop” phase when she showed up in this strange dress to the MTV European Awards in 2013. While we’ve definitely seen the pop star in weirder outfits than this, we don’t quite understand this outfit and we really don’t understand the person who thought it was a good idea to pair this dress with those shoes. We would honestly prefer to see her straddling a wrecking ball than in this mismatched ensemble. We’ve talked about one of Lady Gaga’s red carpet hits so it’s only fair that we talk about what of her major fashion disasters. If you hadn’t heard of Lady Gaga back in 2010, you knew who she was after she showed up to the VMA Awards wearing raw meat all over her body. This savory dress made headlines for weeks on end, which might have been exactly what Gaga was going for, as it earned her a meat locker full of press. Emily Ratajkowski pulled off revealing in an elegant way when she showed up to the Cannes Film Festival in this little black dress but to be honest, the actress and model could really pull anything off. There is a lot going on here but all of the different fabrics seem to come together and create a truly elegant look. The timeless look of the dress balances out, with the cutout panel in front giving it an edgier look. Nicki Minaj has worn so many strange outfits that we have become numb to any of the more risqué fashion choices she makes. So we were not surprised to see Minaj in a very revealing and cut out filled dress to the MTV Awards. While the sides of the dress are sheer, a strategically placed, opaque panel in front ensured that there would not be an wardrobe malfunctions. This dress was a fashion gamble for sure, but we think that Minaj managed to pull it off amazingly. Since Kim Kardashian tied the knot with Kanye West, the rapper has been open about being behind his wife’s evolving style. West certainly has fashion qualifications (he does have his own clothing line), and he often dresses in an avant-garde manner. Case in point: this tuxedo jacket over a flapper skirt number, for which Kim decided to forgo a shirt. If this is the future of fashion, we don’t mind being off-trend. What we really want to know, though, is how that jacket managed to keep Kim covered. Unfortunately for Diane Kruger, this ensemble looks more like curtains or a comforter than a dress that would be appropriate to wear to the Golden Globes. While Kruger is obviously a beautiful woman, this dress does nothing for her and makes her like she is heading home from a fraternity toga party. Thankfully, the actress’ style has evolved since this picture was taken back in the 2000s. Aislinn Derbez showed up the right side of her body in this black dress at the Latin Music Awards in 2016. Although Derbez does look great, it just seems that there is too much much going on for us to give this look the thumbs up. While the Mexican actress’ left side looks put together and elegant we get distracted by all of the cut outs and lines on her right side. Angela Sarafyan took provocative to a whole new level when she wore just the front and back of a dress at the Toast to Young Hollywood party in 2017. But in all seriousness, we know that the actress is wearing an entire dress but from this angle that’s not the impression we get. Had the front and back of this dress been sown together, we think this dress would have been a lot more flattering. Hilary Swank showed up to the Vanity Fair Oscar party in this dress with a very plunging neckline. The actress became well-known after appearing in the film Million Dollar Baby, and she definitely looks like a million bucks in this outfit. Whoever styled Hillary in this look knows what they are doing, as they accessorized with a low-hanging necklace that draws all eyes the sleek cut of the dress. At the Cannes Film Festival in 2011, South African model Candice Boucher showed up this almost entirely sheer black dress that earned her a lot of attention. If it were not for those strategically placed embellishments, we would have seen a lot more of Boucher than she might have hoped. We really hope there were embellishments on the back too otherwise it would have been an embarrassing moment for the model. Kendall Jenner is likely the least dramatic member of the Kardashian-Jenner family, however, in this instance at the Much Music Awards, Kendall brought the drama to the red carpet in this dress with slits all the way up to her hip bones. While this dress is a little over the top, Kendall looks stunning and her legs seem to go on forever. It’s no wonder that she is a world famous model! There is a lot going on with this dress that Ellie Goulding worse to the Brit Awards in 2017. While we like most of the look, we wish that chains all the way down the chest area of this dress could be removed and replaced with opaque black material. We love the high collar neckline and the slit in the skirt, however, the chains are just throwing us of and dragging our attention away from the overall look. Our list has become somewhat of a Brazilian model takeover as the is the third one we’ve mentioned. However, unlike the last two Brazilian models we’ve mentioned, we are not so crazy about Ambrosio’s dress. While we think that the Victoria’s Secret model does look gorgeous as always, the dress just does not have much of a shape. It’s okay to show skin but there has to be some structure to the dress and there just isn’t in this case. This has to be the most revealing dress (although it’s not really a dress) on our list. Although it’s not so visible in this picture, only about a quarter of Shayk’s body is covered by this half jumpsuit have dress look. Her entire left side of her body including her stomach is visible and although that might be ok on a beach, it probably was not the best choice for a Vanity Fair Oscar party.